With the holidays upon us, you may have a lot of company entering your house through the garage and would like to make the space look a little nicer. You may also find yourself wishing you had a better storage system in your garage as you struggle past the lawn care equipment and patio furniture that had to come indoors for the winter, just when you need to get out the holiday decorations and those folding tables and chairs you need to seat everyone for a big family dinner. Why not start planning for a new custom garage or some well-deserved garage improvements in 2019? If your garage is currently uninsulated with an unfinished interior, finishing the interior walls is a great place to start. This is one of the best ways to make the space more attractive and more functional at the same time. 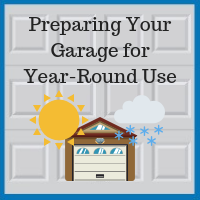 In place of bare studs and siding, a layer of insulation and drywall will help maintain a steadier temperature in the garage year-round, making it more comfortable to work in and creating better conditions for long-term storage. The drywall can also make the space feel brighter, even if you do not paint it. Before putting up the drywall, be sure to add some electrical outlets along the walls and update the overhead lighting to create a more functional work space. If you are a do-it-yourselfer, be sure to read up on the importance of vapor barriers and venting or engage an experienced garage builder. The last thing you want is to create conditions where moisture and mold will build up in your garage. If your garage door is not insulated, you will want to address that as well, especially if it faces to the west. A west-facing garage door takes the brunt of the prevailing winds in the Chicago suburbs as well as the hottest sun of the day. You can add an insulation kit to an existing garage door or buy a whole new door if you really want to improve the curb appeal of your home. In our custom garage photo gallery, you can see how much difference it makes when you install an upgraded garage door versus a plain garage door. 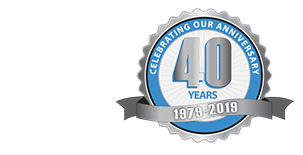 Blue Sky Builders of Downers Grove has been building and repairing custom garages in the Chicago area for almost 40 years. We have built garages from Aurora to Woodridge, which you can view on our website, along with client reviews and ratings of our work. If you want to update your current garage, we handle roofing, siding, windows, and doors. If you want to build a custom garage from scratch, we will take care of the permitting, carefully demo and remove any old building(s) and concrete slabs, pour a new concrete slab, and construct the new building. Contact us at 630-852-8485 to learn more about how we can help create the perfect garage for you.